Lavender has been associated with purity and cleanliness since its infancy with the etymology stemming from lavare “to wash.” Contemporary aromatherapy as we know it today is invariably intertwined with lavender. The French chemist Rene-Maurice Gattefos was in his lab when he accidentally burned himself badly. With no time to waste, he submerged his hand into the closest liquid to him, lavender oil. Astonished at the rate of recovery and minimal scarring from the burn, Rene began to study essential oils and applied oils on soldiers during World War I. We created this ointment with a blend of Sweet Almond Oil, Beeswax, Shea Butter and Lavender Essential oil with this in mind. 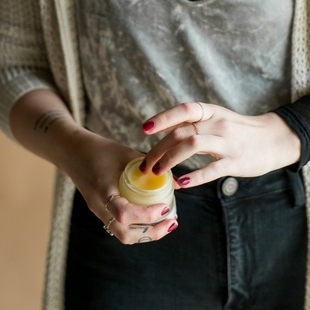 This all-natural healing ointment is sure to give you ample health benefits. In its 2oz frosted glass jar, this product is both easy to travel with and easy to use. Lavender healing ointment has been a game changer this winter. I have developed eczema on my hands and they were dry and cracked, very painful. I began putting this on every night before bed and have seen an amazing improvement. Loving this product; I use it with other products for my rashes and other skin ailments and it works fast and leaves my skin soft. For me; it’s not working as fast ( to take away my rashes ) as I’d hope it would but it’s still an amazing product and my rashes are healing with this product. This has soothed a minor kitchen burn I got the other day. We have used on my son's legs to soothe the itch associated with his bug bites. Great way to have your lavender on hand for burns! I frequently work in the outdoors and used to have cracked skin from dry conditions as well as small cuts from working around brush. My daughter started me using this for my hands. It moisturizes and it heals. It also keeps your hands feeling great. A good product. I actually use this product and the helichrysum oil on my red cheeks twice daily. The lavender salveolar smells wonderful. It does leave an oily residue but I use a cream for my face over it and it completely blends in with the cream. My daughter also uses it on scrapes and it's wonderful for her bc it doesn't sting. I love this stuff and when i empty the container, I'll be buying another one. I really really like this product. It really makes a difference with my son's severe eczema. I work in retail and am often unpacking boxes and plastic packaging. Between dust, packing materials and scrapes from paper and cardboard, my skin often gets random rashes and/or areas of redness, etc. I apply this ointment and it instantly calms my skin, takes away the redness and itching, and seems to act as a protective layer even, if I apply it beforehand. I love it! My husband also just started using it under his knee brace sleeve to keep his skin from getting irritated and it's been a godsend! This is now a staple in our house. I need to get extra jars for my purse and both our work lockers! I had my daughter use this on her two boys as they had red inflamed bumps on their cheeks . Within a matter of minutes their cheeks were not inflamed and within the hour the red bumps has disappeared. Needless to say she was amazed. Since I gave her my jar, I now have to reorder for me to keep at the house. This is perfection in a jar. Simple. Effective. Natural. I use this on scrapes and scratches, especially on my kids. 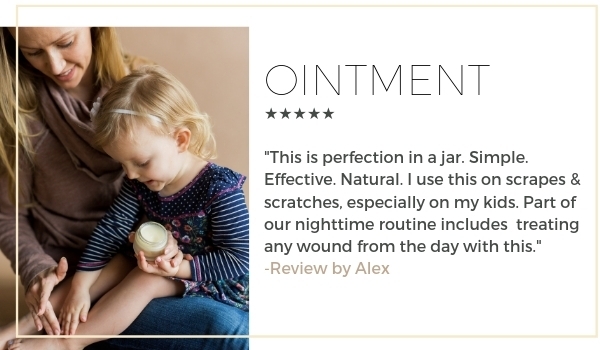 Part of our nighttime routine includes applying EO’s (diluted, of course) and diffusing essential oils, and treating any wound from the day with this. Love. This product works wonderful and it smells so good. I'm not a lavender fan, one of the few out there. Gifted this ointment to a good friend, who swears by it! She reports: great scent, wonderful consistency, very versatile, and a joy to use. Guess what she's getting as her next gift? I absolutely love this ointment. It has been a life saver. My daughter cut her toe and it was swollen/hurt to put pressure on it so I put some of this on it. An hour later she came running outside to tell me that I had bought some miracle ointment...definitely buy it. This is great to rub into your nails and cuticles. I usually have dry cracked nail beds during the winter, but since purchasing this, my nails are healthy and my cuticles are soft and moisturized. I do this at night. I also rub this on my kiddos bug bites for relief, or on chapped dry skin. I cannot say enough how soothing this product is. I highly recommend it. Got this with my CC. We use it all the time. Worked great when my 2 yr old grandson burnt his fingers. He stopped crying when we put it on him. So everyone knows how wonderful lavender is, right? Well I decided to get this ointment since since my feet does occasionally get swollen and inflamed. Anyway, this ointment smells amazing!!! And it eases that inflammation and makes my feet feel so soft and good! Seriously, this product is great. I have read lots use it for eczema and to ease itchiness from bug bites so I plan to use it for that as well. This ointment I will be keeping in my purse at all times! 5tars!!! I had a rash under my arm and this took away the itching and healed it in only a few days. Great ointment! I use lavender for many things and this makes wound treatment much easier. Smells and feels so good. And it works! The ingredients are soothing and work effectively to heal small burns, scrapes. I was very happy I bought it. I got this in my gold package and fell in love! I have already ordered another one because I use it for so many things! It's great for itchy bug bites, healing skin, I even used it on my dog who had some skin issues from an allergy to grass! I put it on scratches, and any area that is irritated on my skin and it relieves the discomfort. I even got my husband to use it for an irritation on his leg and he was skeptical! Now he will ask for " that oil ointment" when he has itchy spots or bug bites! I love Jade Bloom products! At first, I didn't really know how I wanted to use this product. But then decided to use it for my massage business. I apply it to my client's neck and shoulders if they are tight and I need to do some trigger-point work. Helps soothe tension and relax those muscles. And of course smells wonderful! I got this in my gold envelope and tried it on three family members for different skin issues and they reported back that what ever I put on them healed their condition!! And they loved the smell! This is being added to my holistic aid kit! I love that everyone comes to me for remedies! I got this for my mom, who is undergoing radiation treatment for breast cancer. She uses aloe gel just after her treatment, and then applies this Lavender ointment before bed. It smells great and is very soothing. So far she hasn't had any major skin issues from radiation, and I think this ointment is really helping keep irritation to a minimum. I wish I had it sooner! When I burnt my wrist badly with a cast iron skillet, I remembered about this product and immediately placed an order. I had to wait several days and meanwhile I was treating my burn with aloe gel and lavender oil, which worked wonderfully as I was trying to calm the pain. Now that I'm at the point where my burn started to itch a bit, this ointment is just perfect for keeping my skin clean and moisturized at the same time. Highly recommended. I really like the feel and texture of the ointment! I keep it in my fridge for when I need it for burns. I'm a clutz when baking! It's soothing and absorbs nicely! I received this product in the collectors club package. I had been considering the suture healing ointment but I don't really care for the smell (I own the blend) but then I got this surprise. It smells wonderful! Really helps to soothe the minor scrapes and paper cut on my hands.